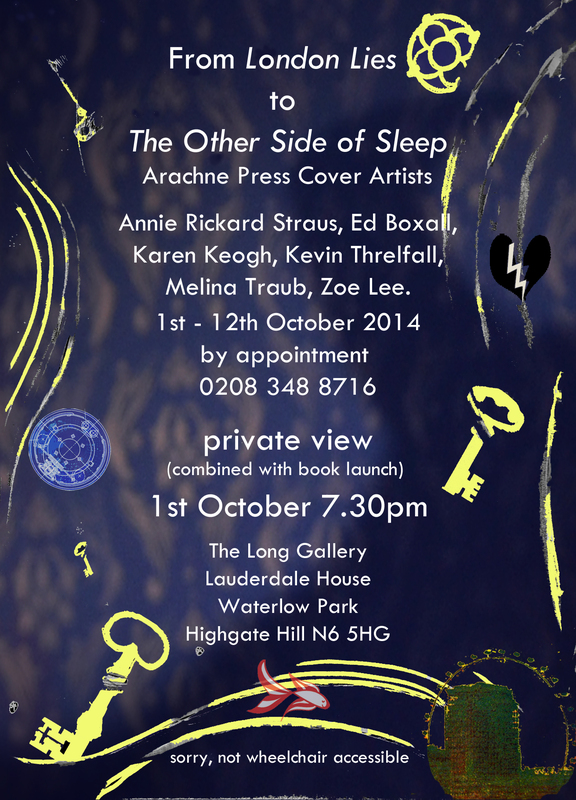 Support our crowd fund campaign for Solstice Shorts Festival by £15.00 or more and get an Invitation to the combined launch of The Other Side of Sleep – Arachne Press’ first Poetry anthology, and the private view of our exhibition of artwork from our cover artists, From London Lies to the Other Side of Sleep. In the Long Gallery at Lauderdale House in Highgate, 1st October 7.30pm, your invitation will include at least one glass of wine, plus chatting with poets and artists, and a copy of the book signed by the cover artist, Zoe Lee and as many of the poets as are there on the night, and any others who are at the Oxford reading the night before. This entry was posted in Art work, Books, Crowd Fund, Events, Launch, poetry, Private View and tagged Cover Art, crowd funding reward, invitation, Lauderdale House, Launch, poetry, private view, Solstice Shorts Festival, The Other Side of Sleep, Zoe Lee by Cherry Potts. Bookmark the permalink.